You gotta be pleased with that. Cooiecrumb: I am sitting on the park bench. You sit down next to me with your Ruth Buzzie looks. "Do you believe in two hearts intertwining to become one?" You swap me with your purse. That is the way I have imangied it. Ruth Buzzi? Dude, I'm the Goldie Hawn. Farmer Brown. You two don't make me get the Tazer. Cookie, Chilebrown is referring not to Ruth's appearance but to the outraged looks she gives that little dirty old man on the park bench. You are definitely the Goldie Hawn lookalike. Chilebrown, corn, no matter its nationality, is food straight from heaven. Home grown and fresh off the stalk, I can only imagine how delicious. Greg, I got the green thumb from my Dad. He used to drag me into the garden. I did ont appeciate it until now. Zoomie, Do not humor the Mad One but your are right. I cannot believe the difference of picking corn and putting it right in thte pot. Good stuff Maynard. 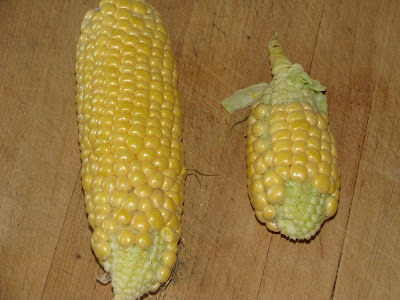 Corn around here was lackluster this year, wish I had grown my own.